Arabella: Does Your Style Mature with You? Top: here (£19 in the sale!) Trousers: here. Shoes: (£21 in the sale!) here. Bag: here. Oh, wow, look at that. A bow blouse. How very original and experimental of me. Clearly I'm kidding, but my current taste is nothing if not consistent. 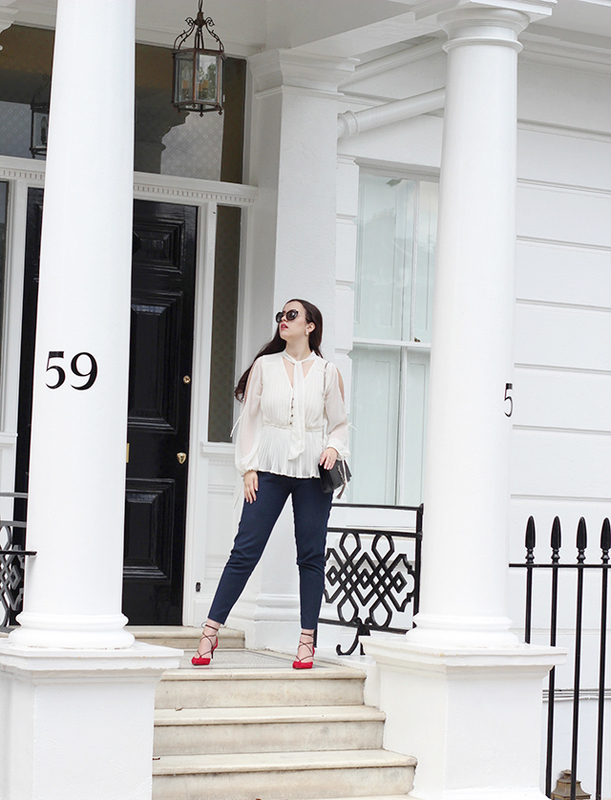 Following on from my last outfit post where things got very colourful and daring, I wanted to even things out a bit by featuring one of my failsafe, go-to outfits; tailored trousers, some form of interesting blouse, pointed shoes. When I think about it, I definitely used to be a bit more wild with my fashion choices when I was younger. Over the last few years, I've found myself gradually pulling back on the things that made my style a little bit more... eccentric, shall we say? I certainly wouldn't say my dress sense is boring, but I might say it's become slightly more 'mature' - whatever that even means. For example, my vast collection of huge, eye-catching statement necklaces and Pat Butcher earrings now sit unworn, replaced with simple pearls and studs. Sometimes I wonder why that is. Your style definitely changes with time, but does it specifically change with age? Have I simply grown out of them or has my style evolved as I've gotten older? What do you think? Has your style changed with time/age? Although it's a look we're familiar with, it looks absolutely fabulous and somehow always fresh on you... I've certainly gone through quite some style changes (and am in no hurry -yet- to settle down), but I've become far less experimental and stick to a few 'rules' that through experience I've noticed work the best on me (and makes me feel good).